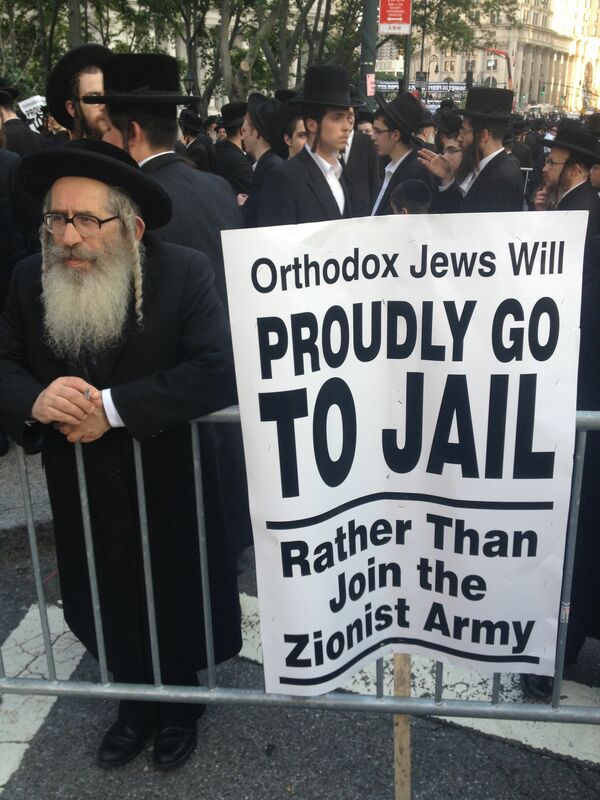 JNN 04 May 2015 NEW YORK — Marchers in the Israel Day Parade up Fifth Avenue faced Resistant as the Anti-Israeli protesters have blocked the way : Orthodox Jews who don’t believe Israel should exist. Orthodox Jews, who do not believe in the existence of Tel Aviv regime, blocked their way despite tight police security for the parade. On the sidelines behind police barricades were several dozen men from the Neturei Karta International organization, based in the hamlet of Monsey, about an hour north of New York. They’re calling for the dismantling of the Jewish state, believing that Jews are forbidden from having their own state until the arrival of their messiah. The parade that has annually been held in New York since 1964, was met by New York Governor Andrew Cuomo, Mayor Bill de Blasio and members of New York’s Congressional delegation as well as those of the Israeli parliament, the Knesset. Human rights monitor Amnesty International said earlier this year that the Israeli regime committed war crimes during the latest war on the besieged Gaza Strip. Over 2,140 Palestinians, including a large number of women, children, and the elderly, were killed in the 50 days of the Israeli onslaught on Gaza, which began early in July 2014. This entry was posted in America, United States and tagged Anti Israel, israel, Israel Day, israeli parliament, Neturei Karta International, New York, New York Governor Andrew Cuomo, Orthodox Jews, Parade. Bookmark the permalink.